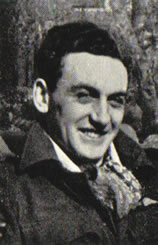 Johnny Edwards was born in 1920 and attended George Heriot’s School from 1932 – 1938. He was the only son of Mr James Baxter Edwards and of the late Mrs Elizabeth Bisset Edwards, 28 Hutchison Loan. He was an excellent scholar and B.8 Bursar. He was in the School Rugby 2nd XV and the Athletic Club. He joined the Civil Service in 1939. He volunteered for the Air Force in July 1940 and was attached to No.91 (Nigerian) Squadron on reconnaissance patrol work. He failed to return from a dawn patrol over the Ostend area on 23rd September 1942. He is still remembered in St Michael’s in 2005 when he was described as being “really good looking, and awfu’ nice“. He died at the age of 22 and his name is on the WW2 memorial of St Michael’s Church.